A good pair of ski pants can help you stay warm and dry if you’re skiing, snowboarding, or even just trying to stay warm day to day in a harsh climate. Choosing the right ones can be tricky, especially for women. Whether you’re plus size or petite, finding a pair of ski or snowboarding pants that fit well isn’t always easy. If they’re not too short, they’re probably too long. If they fit your thighs, they might not fit your waist. As far as fit goes, if you can find a pair with an adjustable waist and the right inseam, you’ll be golden. 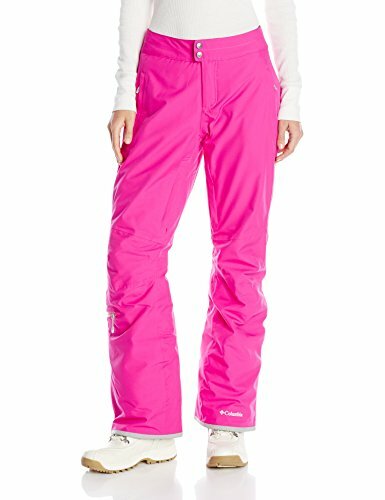 Above all, you want a pair of ski pants or snow pants that have a style with quality fabric that ensures breath-ability and look good, matching your ski bibs, ski jackets, and other ski apparel—a must for all women skiers! 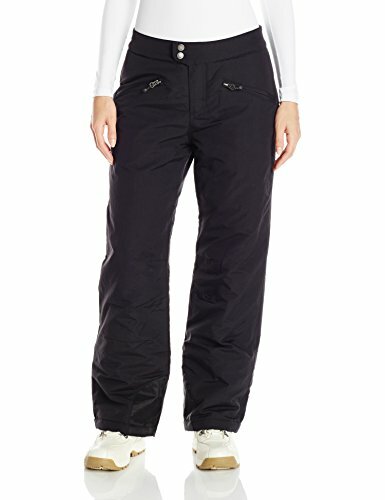 More importantly, though, you need ski and snowboard pants that keep you warm and let you move freely. Internal gaiters are a must and having waterproof pockets that zip closed is an added bonus. We’ve rounded up 4 of the best pairs of women’s ski pants to help you find one that’s just right for you. There are so many reasons why the Bugaboo Pant from Columbia gets the top spot. First of all, they’re waterproof. The seams are fully sealed to keep out water and protect against harsh winds yet they’re still breathable. They not only keep you dry; they keep you comfortable. The fit on these pants is phenomenal. For starters, they move with you. 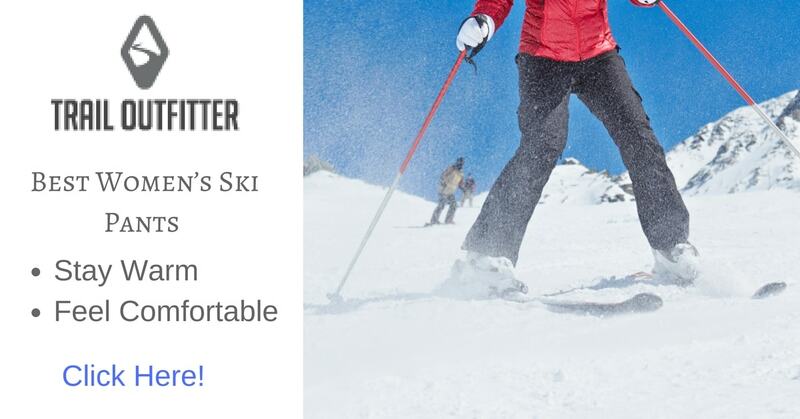 They never feel stiff or hinder movement which makes them great for skiing, snowboarding, or any other cold weather activities. The waist is adjustable so you can get the fit just right. There’s an internal adjustable gaiter so you get the necessary protection from the cold and snow while still looking stylish. Durability is built right into these pants with lower leg snap gussets and reinforced leg hems. Zipped pockets let you keep small valuables safe, secure, and dry. Add to all this, the polyester insulation and you have an awesome pair of pants that will help make your snowy experience outdoors all that more enjoyable. If you aren’t sold already, here’s the detail that will seal the deal. These pants are available in different lengths. The short version has a 29.5-inch inseam while the regular has a 32-inch inseam. Between these 2 lengths and the adjustable waist, it should be a little easier to find a pair that fits properly, whether you’re short or tall. The woman’s Toboggan pants are available in a range of sizes from small to extra-large all with a 29” inseam. To help you get just the right fit, they even come with an internal adjustable waistband. 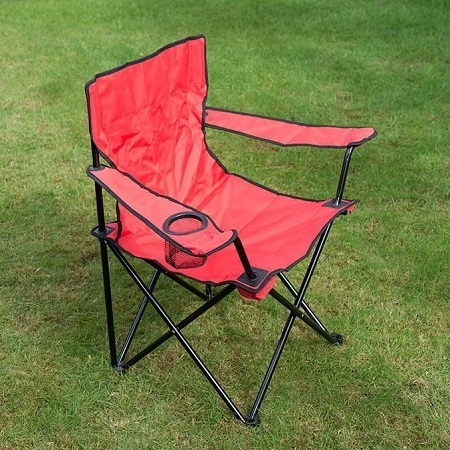 The nylon shell is coated and waterproof while the taffeta lining is insulated with polyfill. There are even internal gaiters with elastic grippers to add an extra layer of protection. Whether snow, rain, or gusty wind, these pants will keep you protected against any unpredictable winter weather. There are a lot of little things about these pants that make them even more comfortable and great for harsh weather. For one, the metal snap closure makes it really easy to get them off and on. Plus, the knees are articulated to help keep movement unrestricted so you don’t have that stiff feeling when you’re trying to ski. Zippered hand pockets keep anything you need to carry safe and dry. And that’s not all! These pants are available in 2 different colors: black asphalt and caviar green. One thing to keep in mind is that the sizes run a little small. If you’re looking for an awesome pair of ski pants that also lets you show off a bit of your personality, APTRO has the perfect pair for you. While the other options on this list either come in a few colors, these give you 10 different options: blue, coral red, mint green, multicolor, pink, purple, rose pink, sky blue, yellow-green, and light green. Pick the one that lets you stand out the most on the slopes! Even though these pants are waterproof, they still feel really soft and smooth. They’re also breathable and have thigh zippers when you need extra ventilation to help keep you extra comfortable. Plus, they’re durable. Because they’re insulated with high-quality cotton material, they hold in your body heat and keep you protected from wind and water. That’s not all! There are internal gaiters that hook onto your boots to keep the snow out. These are also a great choice for women on the taller side because they do run a bit long. They’re also available in sizes XS to XL. If you like pockets in your ski pants, you’re in luck. There are snap cargo pockets on each let. Plus, two rear pockets—one that snaps and one that zippers. 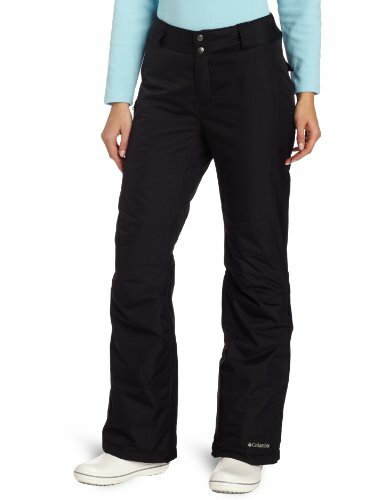 One of the things that sets the Columbia Sportswear Women’s Veloca Vixen Pant apart is the exaggerated waistband. It features large panels and elastic insets the keep the fit snug and secure even when you’re being really active. They’re also adjustable so you can tailor them to be the perfect fit for you. Making adjustments is really easy, too, because it’s all done with Velcro. Another great thing about these pants is that they’re long. The regular inseam in 31.5”, which is very generous! If you’re tall, these are a great option. With these pants, you don’t need to worry about warmth, either. These pants are waterproof but still breathable. Thermal reflective lining and sealed seams conserve your body heat to keep you nice and toasty during all your outdoor adventures. There are also internal, adjustable leg gaiters to keep out any moisture. If you get too hot, there’s leg ventilation. There are also two side pockets and a lower leg pocket on the right side. All 3 are waterproof with a zipper closure so you have plenty of room to keep your belongings. You won’t feel stiff like you can’t move in these pants, either, thanks to the articulated knees.